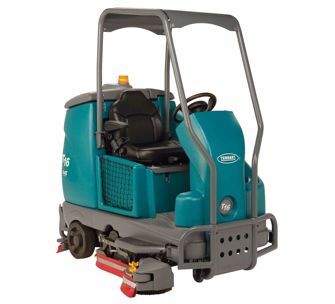 The Tennant T16 is an industrial grade, self-propelled, ride-on, high-performance scrubber manufactured in the U.S. The T16 scrubber has the ability to clean virtually any hard floor surface. The T16 is available with a disk scrub deck or cylindrical scrub/sweep deck. With the cylindrical scrub deck, manual sweeping is eliminated. You can also increase the T16 cleaning path from 36 inches to 46 inches (28% wider) with the optional scrubbing side brush. With fully charged batteries, the T16 rider high performance scrubber will clean for up to two hours and forty five minutes. Run time for the T16 can be increased up to four hours and fifteen minutes with the optional battery pack upgrade. Power key ignition switch, and emergency power kill switch are both standard features on the T16 dashboard. An integrated operator safety switch stops the T16 compact rider high performance scrubber unless the operator is seated. Powerful AC drive propel motor allows for excellent ramp climbing capabilities. Because the T16 AC drive propel motor is sealed and brushless, it offers extended component life, and less maintenance. Large operator legroom means the T16 is comfortable and reduces fatigue. The T16 also has excellent operator visibility for confident maneuvering in tight or congested areas. Unlike other scrubbers which require both feet to operate, T16 has car like pedals for easy single foot operation. The T16 is corrosion resistant due to a cast aluminum drive system, cast aluminum cylindrical brush deck, and cast aluminum squeegee assembly. Further corrosion resistance is enhanced by the rotationally molded polyethylene body panels, and solution/recovery tanks. Steel components on the T16 are coated with industrial grade enamel paint. Large Green 1-step start button on the T16 dashboard turns the preset scrub functions on and off. Once you have set the desired scrub functions, this is the only button you need to press. All of the functions on the T16 can be controlled independently as needed. A standard feature of the T16 is the “economy” setting for brush pressure and solution flow. When in the “economy” mode the T16 run time is increased, brush wear is decreased, and water/detergent consumption are decreased. Another popular and useful option for the T16 is the Hydrolink battery watering system. Hydrolink battery watering system will ensure that your batteries are filled to the correct level and help lengthen battery life. The battery watering system requires no special training (simple to use) and requires no tools.